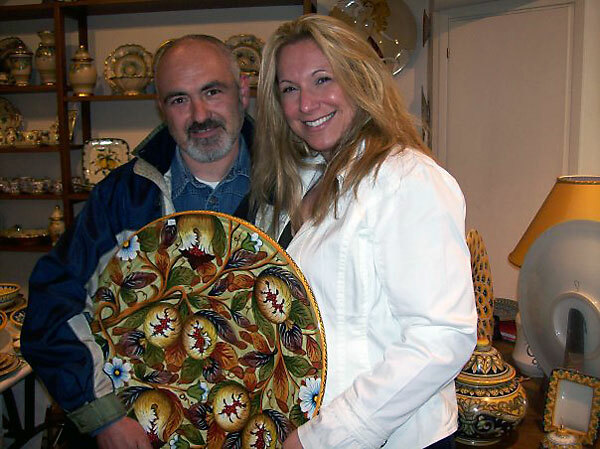 Sorella Luna has worked over the last four years to find the best quality of ceramics and to build relationships with the manufacturers. We brings you the experience of these age-old and ancient techniques to the ceramics that we offer. 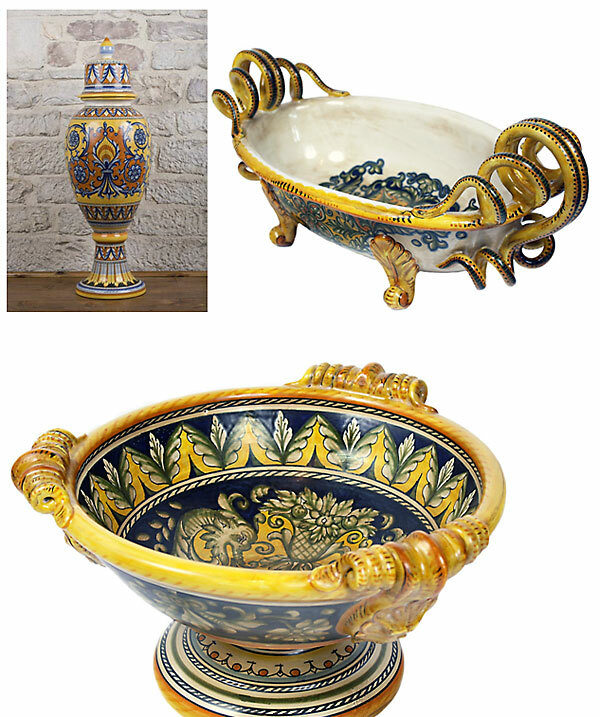 Currently, we work with 10 artisans/manufacturers from Italy, and would like to show the Majolica two-fire or three-fire process through the different manufacturers. Located at the end of "Ceramic Row" in lower Deruta, the vibrant Gialletti Giulio ceramic factory has become one of the largest manufacturers of ceramics in the region. Founded by father Giulio, the factory is now run by sons Antonio and Carlo who are committed to quality and excellence. 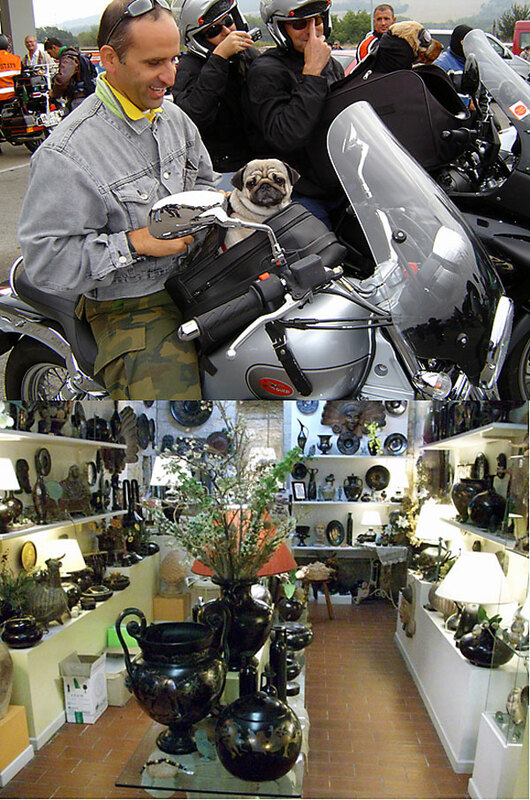 Their products range from tea-lite candles to huge yard urns. Sorella Luna has an excellent friendship and working relationship with the Gialletti family and business. After the primer glaze has dried, the painting can be applied. Some designs are free-form painting while other more complicated designs may require a guideline drawn first with a special pencil that will not scrape the primer coat. Shown below is the beginning of a bowl painting. 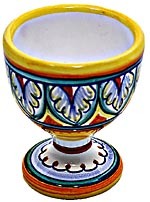 After invading Spain and Italy in the 1200's, they brought the majolica (Maiolica) technique to particularly the Spanish. Originally, majolica used tin or lead glazes to seal the earthenware, and other earth metals were used for coloring. Although some lead is used in Italy, most artisans do not use lead anymore. After the painting is completed, the product is now ready for high fire. Temperatures vary from factory to factory, but as a guess, a cone 6 is the average temperature level used for the red porcelain clay. Below: Examples of two plates from Gialetti Giulio. FIMA has gained an excellent reputation throughout the U.S. for quality. Their precise paintings are stunning, particularly of the Ricco Deruta, Rafaellesco and Ricco Vario styles. FIMA is the premier factory for Sorella Luna's exquisite dish and tableware. Sorella Luna has worked with FIMA to develop new styles and new forms that produce unique products for our customers. Special orders are prepared by FIMA with extreme care and detail for our customers. Below left, a Piside, or urn, is painted for Sorella Luna (Item Number: URNDPH3822RG). Below right, a ceramic teapot top is carefully coated with primer. Wooden boards are often used by the artisan to steady the painter's hands or to act as a shelf for smaller items after submersion in primer. Below one of FIMA's 3-piece dinner settings (PSERCV280703). Massimilliano Ninci lives outside of Montelupo just north of San Gimignano in Tuscany. His signature painting styles of grapes, lemons, olives and pomegranates bring the Tuscan landscape directly to your home. Colorful landscapes surrounded by cedars, poppies, sunflowers and vineyards reach into the Amalfi country side where he was raised. 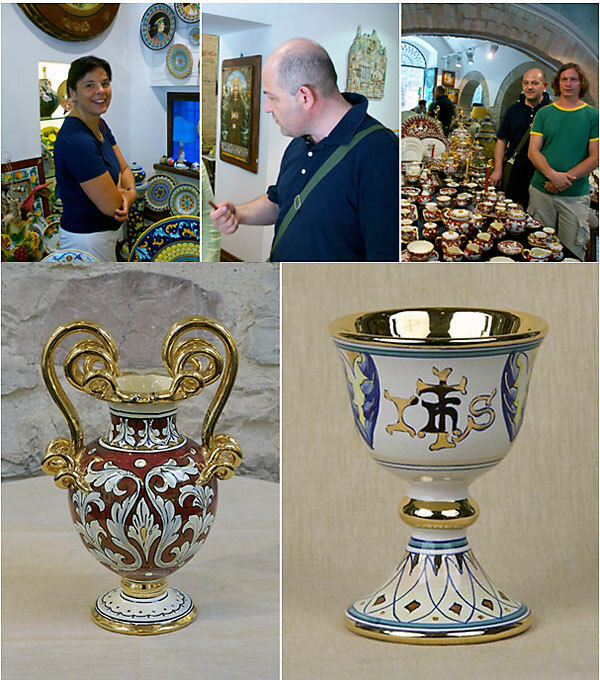 Immediately below, Mary Johnson and Massimilliano are shown here in Assisi where they met for the first time in the ceramic shop of AngelloBalla. They are holding up the 52cm Pomegranate platter (item number: PLTPOM0052NN). Ninci has a knack for producing very practical items such as olive trays, kitchen canisters, olive oil and vinegar dispensers and cruets as well. Below: Giovanni Angello visiting Massimilliano at his Ceramics Factory just south of Montelupo, Italy. Located in upper Deruta, FIDIA is consists of 10 members of the Veschini family of artisans, notably Attilio and Rossella Quintili. Their unique artistry blends the richness of deep cobalt with geometries and acanthus while resurrecting the delicate Medieval styles. One of the accomplishments of the FIDIA work is the consistency andrichness of the glazes. Whereas many artisans may produce works leaving noticeable brushstroke streaks in their background base, FIDIA presents a very consistent deep color background on their art. 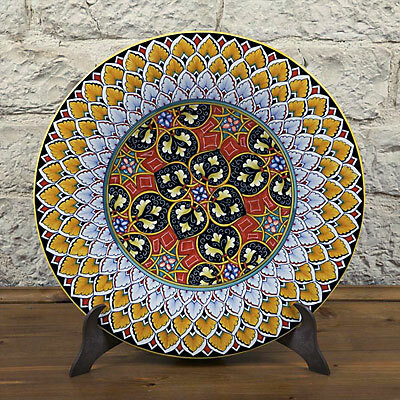 A hint of Arabic influence together with perfecting the Lustro firing technique produces ceramic artwork that cannot be found anywhere else. The FIDIA showroom displays many pieces that are over 100 years old. The pictures below show some of the items that are of the Lustro technique. The Lustro technique involves a variation on the second high fire. To get the lustrous shine as shown in the vase at left, two things are done to maximize the reflection of the product. First, certain glazes are used for their ability to reflect after the process. The most notable are: the extract from the Calendula Flower (to induce a lusterous light beige) and Cobalt (to induce a reflective deep blue). After the ceramics have been painted with the select glazes, the second firing is then starved of oxygen, much like (but not exactly like) the Japanese raku technique. The lack of oxygen stresses out the ceramic such that about 40% of the product does not survive the second high firing. This is the main reason why most artisans do not produce lustro products. Because of this fact and the very beauty of the end product makes lustro ceramics very desirable. Considered a master in his own right, Umberto Nicolini, age 81, still paints today. He was commissioned to reproduce Church Relics by the State of Umbria over 40 years ago until the present. Whether creating a masterpiece brought to you or working in exacting detail on those ancient works, care is given to each paint stroke. The Nicolini factory is run by wife Anna and daughter Maria Rita. Maria Rita also a very talented artist (her fantastic yellow and green peacock plates anchor the North display of our gallery). The Nicolini factory is located in lower Deruta. 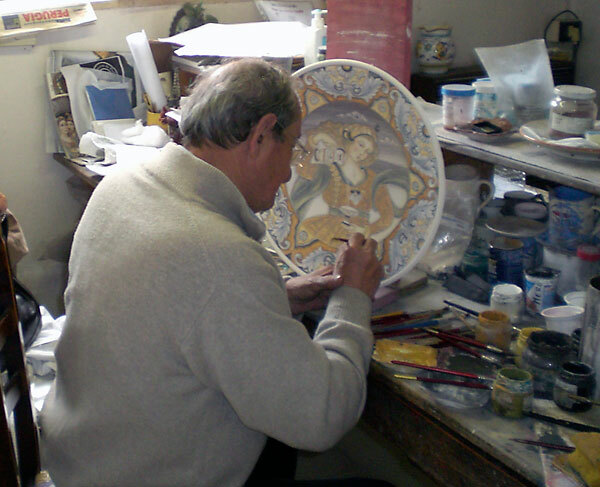 Below: Umberto Nicolini puts the finishing touches on a portrait plate. Beneath left: Anna Nicolini and Giovanni Angello. Beneath right: Sara, a painter at the Nicolini factory, paints ceramics boxes. Mario and Iliana Sambuco operate the their factory located in lower Deruta. Sambuco is best known for their 3-fire, 18-carat, gold-leaf firing process. With this technique, Sambuco creates stunning yet durable products such as vases, tureens, and coffee and tea servies. They also have the most beautiful religious articles. Below Left: Iliana. Below Center: Mario Sambuco. Below Right: Giovanni and Mario next to Sambuco's "Rubino e Oro" collection. Beneath left: Anfora, right: Religious chalice. Located next door to Sambuco, the Mateucci brothers, Emanuele and Alessandro, run their SERMAT factory. Their unique medieval style is unmistakably present in the creations of chess boards, large urns, clocks and centerpieces. SERMAT produces the widest range of floor art and centerpieces that would make any living space come alive and appear more prosperous and timeless. The brothers make shapes and choose colors that are very tied to their style and transcend tradition into a renaissance and medieval past. SERMAT's direction into off-center designs has paid off with surreal plates, bowls and clocks. 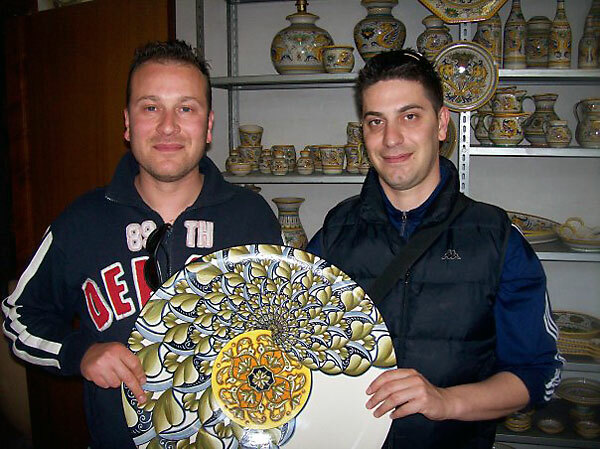 Below: Emanuele (left) and Alessandro (right) holding up a signature 52cm off-center plate at their factory in lower Deruta. Patrizio Chiucchiu, one of the most revered ceramic masters in Deruta, got his inspiration to being a ceramicist from playing around in his backyard as a small boy of 11 years old. Upon finding ceramic shards from vases and plates made over 300 years ago, he at once knew what he wanted to be from that time on. 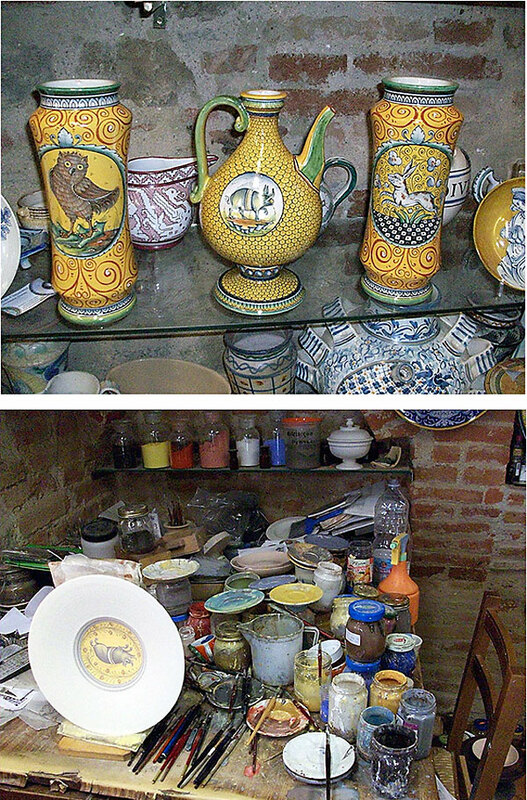 Patrizio still makes all his own glazes from shaving metals and mixing plants and flowers. While he carries on the traditional motifs in his designs, he has also established his own signature designs and borders. Stunning animal portraits and whimsical insects reside in the oceans and forests against a myriad of Patrizio's backdrops. 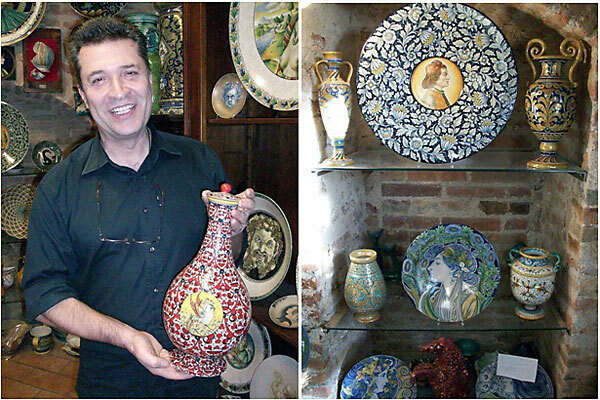 Below left: The maestro Patrizio Chiucchiu holding a vase with one of his signature backdrops in red. Below right: an alcove in his small Deruta studio shows unique portraits, lustro vases, and majolica ceramics. Chiucchiu embraces all aspects of the ceramic artistry. He makes his glazes from metal shavings, flowers and elementary substances. Below: Vases and pitcher showing some of the animals and backgrounds that Chiucchiu draws. Beneath: Chiucchiu's humble painting station. 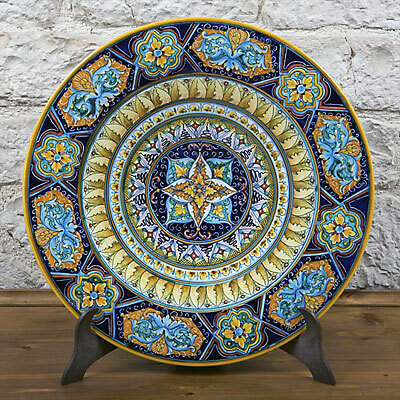 Sabrina Matteucci and Raimondo Baffoni create one-of-a-kind pieces in their fabulous bucchero and unique majolica style art. They are fun-loving people who work hard and achieve excellence in their art. Sorella Luna is the only retail store in the world besides their gallery to carry Baffoni products. Because their pieces are generally one-of-a-kind, our website has not yet captured individual pieces that have sold. Below, a luncheon with Sabrina Matteucci (front left), Laura Balla (back left), Leona Matteucci (back right) and Giovanni Angello (front right). 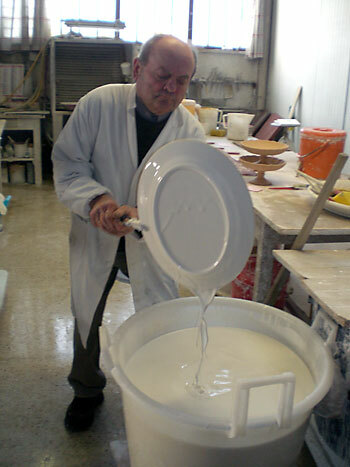 Raimondo buys the raw clay and mixes the formulas with tractor buckets for their ceramic base. He also throws and makes the forms and does the firing. Sabrina is the painting artist for both majolica and inlaid platinum glazing. She also has a patented technique for her unique majolica surfaces. Below: Raimondo and Melinda (pug). Beneath: Sabrina and Raimondo's gallery in Gubbio. 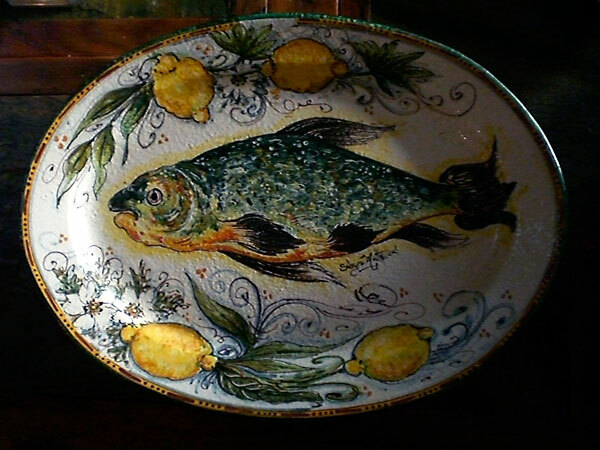 Next Page: Giovanni Angello's personal fish platter made by Baffoni Ceramicha shows the unique surface. Gialletti Pinpinelli (GP) -- Related to Gialletti Giulio by their grandfather and located next door, GP has branched out into their own style of products. They have some amazing designs, complimenting their cousins' beautiful array of art full of flowers, fruit and geometrical patterns. Sorella Luna currently has a small stock of GP, and is maneuvering to carry several lines of Gialletti Pimpinelli in the near future. 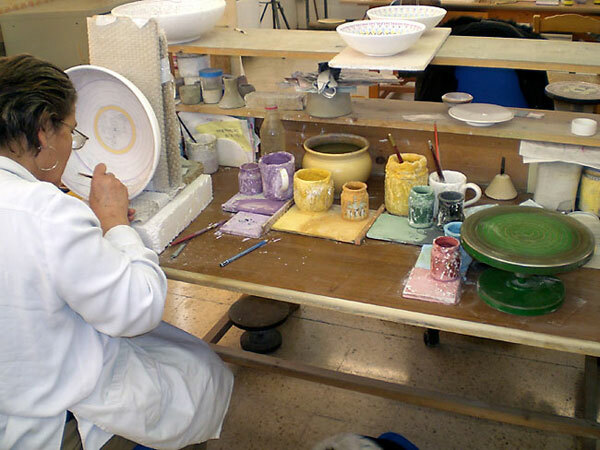 IMA -- IMA is the largest commercial producer of ceramics in Montelupo, Tuscany. Sorella Luna has experimented with pieces from IMA in their gallery with favorable response. The product most likely to be carried by Sorella Luna from them is the Tuscan country style and fruit pieces. Maestro Mancinelli -- With a very small purchase of 5 one-of-a-kind pieces purchased from this artist, Sorella Luna has shown Mancinelli's work with favorable response as well. His technique is heavy and direct which gives a new dimension to the gallery. Currently, Sorella Luna does not plan to carry Mancinelli's work in large quantities. As much as we love our artisans, we love to explore new forms of art and meet new artists. Sorella Luna is always looking for the most talented artisans dedicated to quality. If you have an artisan that you admire, please let us know. That may help us to invite that artisan into our family. We will enjoy it as much as you will. Ciao! !